"My husband always thought meatloaf was bland and like a large hamburger. I came up with this recipe, now he wants it at least once or more a month!!" Preheat oven to 350 degrees F (175 degrees C). Spray a 9x5 inch loaf pan with nonstick cooking spray. 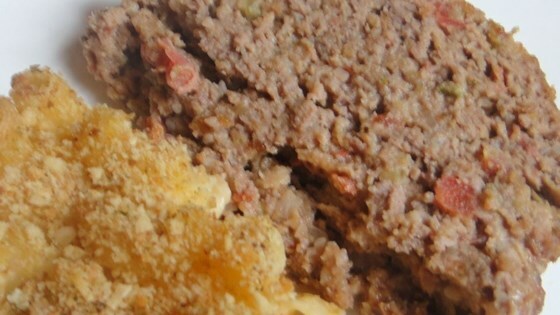 In food processor or blender, pulse stuffing mix to fine crumbs; place in large bowl. Stir in ground beef, ground pork, onion, green pepper, tomatoes, eggs, seasoned salt, seasoning blend, and pepper. Use your hands to mix very well; pat into prepared pan. Bake in preheated oven until no longer pink in the center, 45 minutes to 1 hour. An instant-read thermometer inserted into the center should read at least 160 degrees F (72 degrees C). Cool for 5 to 10 minutes before slicing. Very good! I followed the recipe exactly, but added a ketchup & brown sugar topping for the last 10 minutes of cook time. After a long search I have found my "forever" meatloaf recipe. Even my husband (a real hard case) pronounced it "excellent." No tweaking needed. I have loved meatloaf my entire life and tried many recipes. This is the BEST recipe for meatloaf I have ever had. My husband loved it too! My family just loved it. Almost ate all of it in one night. Great, easy recipe.